National touring/recording band, Topper presents their multi dimensional tribute show, “Voices Of Rock & Soul!”, the greatest classic Rock & Soul artists and music from the ‘60s through the Millennium with the band, Topper as time traveling entities, calling up these legendary songs and artists. Selected original music from Topper’s recordings on the indie label, Ring Records are also included in the show. The presentation centers around lead vocalist, Pete George’s ability to assimilate the characteristics of virtually any major vocalist, true to form and featuring the showmanship, vocals and guitar heroics of David Rodé, plus the amazing young rhythm section tandem of bassist Nathaniel Payne and drummer, Cody Spiva. Beautiful female vocalist supreme, Miami will be experienced onstage with the band, as well! Topper also includes the best of Rock, Soul, Funk, Pop, Blues, Reggae, Country Dance and original music at concerts, festivals, casino, club, corporate and private events. Topper constantly adds new material and show routines to their huge repertoire, keeping the band’s performances fresh and vital everywhere the band plays! 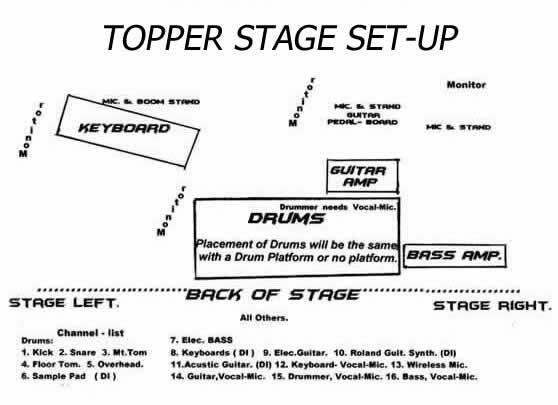 Click here for “Topper’s Electronic Press Kit”. Click on photo for full size then "save as" to download full size promo pic.